Well, he's on the cover anyway. EA held a special event to celebrate the NFL draft this past week in New York City. Among the events was a special photo shoot with the starring athlete. Right smack dab in the middle of Times Square (during an episode of ESPN's Sportsnation) EA Sports unveiled that the Detroit Lions' own Calvin Johnson had won out over Panthers QB Cam Newton. The 64 player tournament tasked fans worldwide with the job of selecting the player that would grace the cover of Madden 13. With the victory, the 6th-seeded Johnson will be the first Detroit Lions player to appear on the cover since a shaded image of running back Barry Sanders shared the cover with Coach John Madden in 1999 (Madden NFL 2000), and the first wide receiver in Madden NFL franchise history to appear solo on the cover. “Knowing that millions of fans took part in the campaign, and to be the one they selected to appear on the cover of the game they play every day is an honor,” said an ecstatic Johnson. “To make it this far, and to beat out guys like Cam and Aaron Rodgers, a Super Bowl winning quarterback, it’s surreal to say the least. Much love to all the fans who voted for me.” But before news spread that Johnson would be the next cover athlete of the award-winning sports video game franchise, both finalists entertained the New York City crowd with Cowherd and Beadle by sharing some thoughts and insights of their run through the campaign, trading friendly barbs with one another, and throwing food through a carnival-style cardboard cutout during the one-hour program. At the conclusion of the event, Johnson took a victory lap of sorts by staying on stage and conducting a 90-minute photo shoot as the capacity crowd looked on. 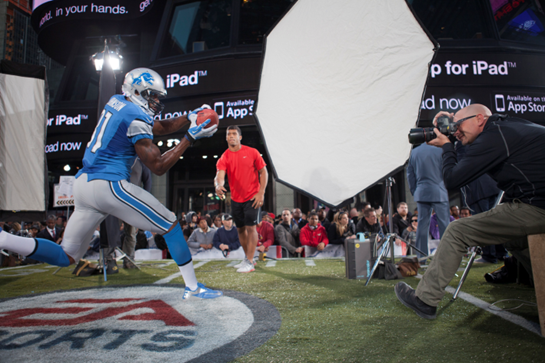 A select photo of Johnson taken during his Times Square shoot will appear on the game’s cover when Madden NFL 13 hits stores nationwide on August 28. Madden NFL 13 will be available later this Summer (kicking off the big Fall game release season) for every console known to man.